The “Camp Fire” camp been ravaging land and infrastructure throughout the town of Paradis, California for over a week now and has killed 77 people so far, becoming the most devastating wildfire the state had ever seen. The “Camp Fire” broke out on November 8 and continues to blaze on, with thousands of people remaining unaccounted for and the death toll still rising. The wildfire began as a small blaze in the foothills of the Sierra Nevada mountains before it was whipped by gusts of winds and transformed into its current state. Hundreds of firefighters have been battling to suppress the “Camp Fire” in addition to two other smaller wildfires that have broken out since then. Although Cal Fire has stated that “there has been no determination on the cause of the Camp Fire,” a Pacific Gas and Electric high-voltage power line malfunctioned about fifteen minutes before the fire was first spotted near to the accident. 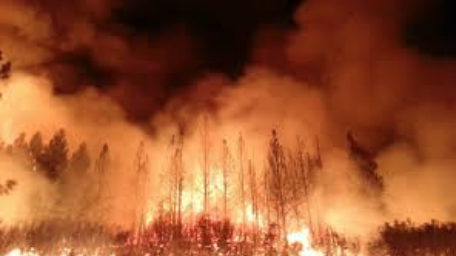 Columbia University fire expert, Park Williams, says that due to climate change, California has become hotter and dryer over the last two decades causing an upward trend in the ferocity and size of wildfires since the 1980’s. “These same fires today are occurring in a world roughly three degrees Fahrenheit warmer than it would have been without warming,” said Williams. California has warmed by about three degrees Fahrenheit over recent years, so it has become much harder to combat wildfires that occur. California now has some of the most polluted cities in the world now due to the fires. Dan Jaffe, professor of environmental chemistry at the University of Washington, says that this is “an air quality emergency.” He added that these fires could undermine the decades of progress California has made in regard to pollution. “This is unprecedented. No one has had to deal with this magnitude that caused so much destruction and regrettably so much death,” said Butte County Sheriff and Coroner Kory Honea. The fire has also destroyed up to 11,730 homes and 472 businesses, leaving thousands of people homeless and some residing in a tent city outside of a Walmart. Others have found temporary refuge with friends and family. “We have a long resettlement effort on our hands,” said Ed Mayer who is the executive director of the Butte County Housing Authority. Mayer has suggested that it could take up to even five to seven years to resettle everyone. It is estimated that about a thousand people are missing, but officials say it is hard to tell exactly how many people are unaccounted for since the numbers keep increasing on a daily basis. “That is raw data we’re collecting from phone calls, emails, and the 911 system. It’s not perfect data, but our thought process is that it’s better to get that information out to help start getting people accounted for,” said Honea. Honea also says that some of the people who are missing have actually escaped the fires and are unaware that they are unaccounted for. Officials are making the list of missing people open to the public so people can confirm that they are safe. Throughout this tragedy, everyone has been working together to support each other the best they can. One woman, Sadia Quint, does not have any information about her family members that lived in Paradise. “We’re being patient just because we know we’re not the only family that’s going through this right now. So everyone’s kind of in it together and everyone’s being really supportive,” said Quint. There is now rain in the week’s forecast that will stifle some of the flames and bring much-needed relief. However, these future downpours bring new dangers such as mudslides, which would be incredibly dangerous for firefighters who have already risked a tremendous amount combatting the fires. These fires have left a physical and emotional toll on the firefighters but their service will not go unrecognized. Copyright © 2019 The Talon. All rights reserved.